Orkut recently went for a makeover which was more colorful and refreshing. Orkut has added more options (aka colors) to customize your Orkut profile look. 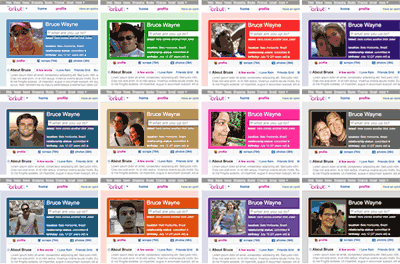 Instead of 5 colors now there are over 35 colors to chose from to color your Orkut profile page. Just hover the mouse over the color palette to expand it (above your status listing). You can click on any color in the expanded color palette and change the overall profile look. Even background color will change according to new hue of the selected color. new orkut option is not activated in my internet explorer..
new orkut does not support internet explorer 6………….it supports mozilla, google chrome,internet explorer 8.
i want to change new orkut theme. so how can i create new theme. if you have any website link please send me as soon as possible.